When it comes to India, luxury travelers might hesitate and be afraid due to security and health reasons. It would be a liar if we would say, we didn't but in the end we decided go without further doubts and finally the only words we can say are that we were speechless and overwhelmed of the outrageous hospitality, friendly mentality and the beauty of the country! 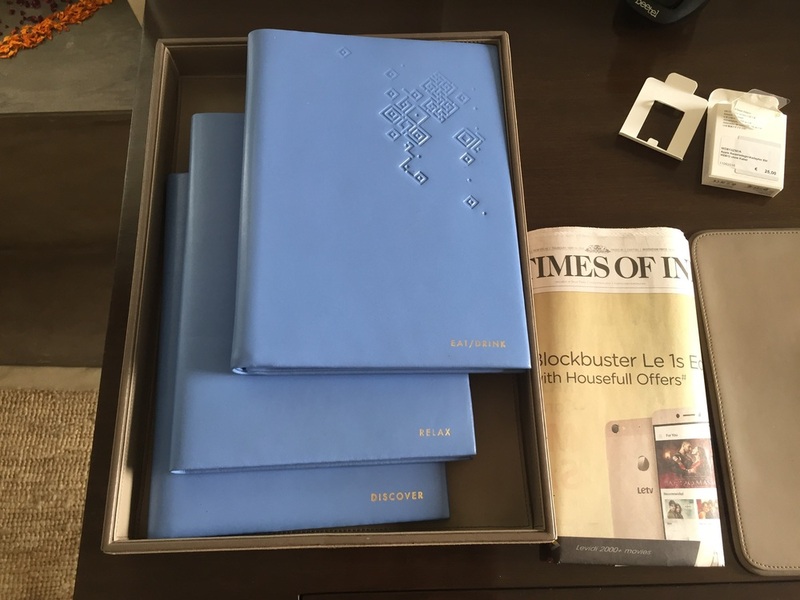 All these things came without expectations, however the decision to stay at New Delhi's absolute number one and definitely one of India's best places to stay, was something we won't regret for centuries! So how did our first time in India start? I love Asian hotels, they tend to be perfect and they are famous for having their own fleet of hotel cars. So we got picked up by an Audi Q7 and driven directly to The Lodhi - tha capital's number one address to say it in three words. The wi-fi inside the car was a surprising add-on and helped us look away from the unusual traffic habits of India ;-). 30 minutes after we claimed our baggage at the airport, we arrived at the hotel's gate were the car was checked by five security guys (this is a usual process in India to prevent from terror attacks). Upon driving through the entrance, the doors were opened, the luggage scanned and we were picked up the Sales Managers and accompanied to the lobby (of course we had to pass security as well). In the lobby, an alley of staff members welcomed us and one took us immediately to the room - in India's high end hotels, you're not checking in at the front desk! Room 701 - a Lodhi Premier Room was the kind surprise the hotel offered us on occasion of my colleague Lukas' birthday - of course in addition to an excellent cake! So upon opening the doors of our room (well, I prefer the word suite as it was more spacious than any other junior suite in the city), we both were standing in the middle of the room completely speechless and impressed. Lots of daylight, wonderful design, vast spaces, amazing views, a lovely smell and the sound of water flushing - coming from the private Plunge Pool. 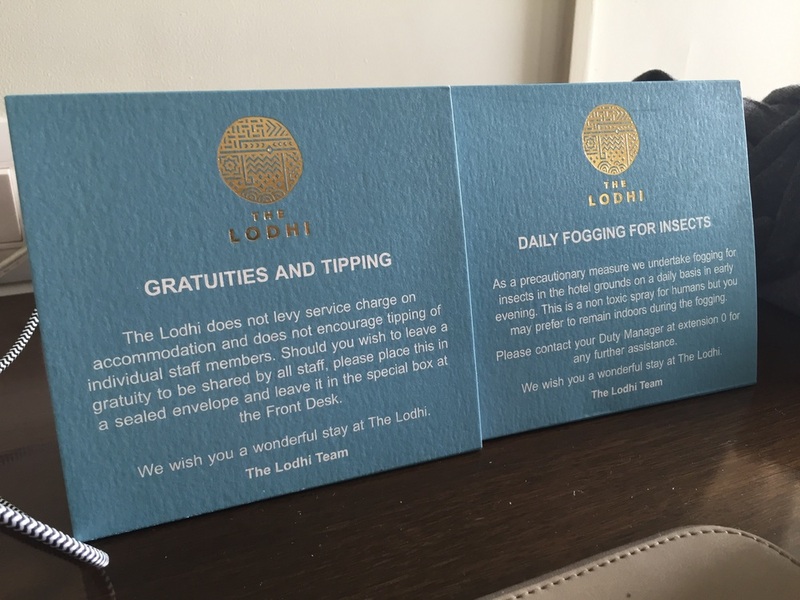 Indeed, The Lodhi Hotel is the first city hotel we have stayed at that features a private pool in each and every room - and that's reason enough to stay here! 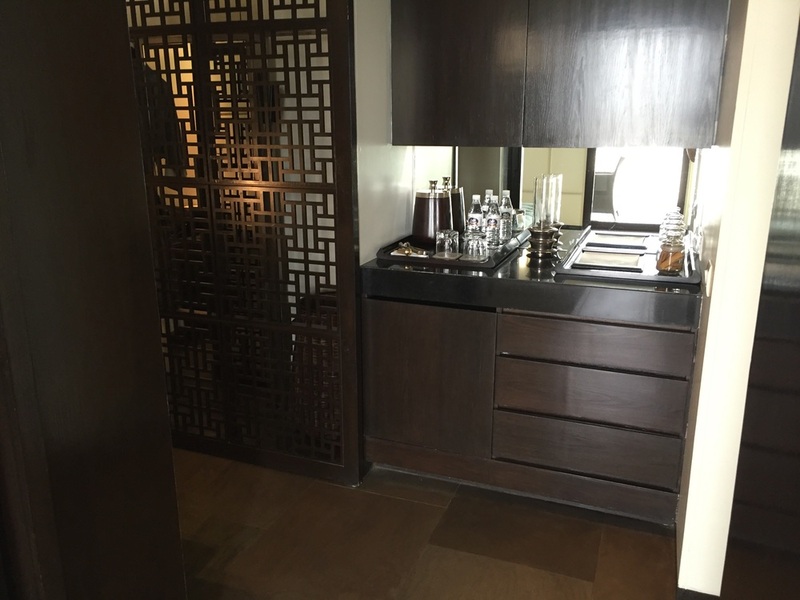 Our tour continued and we were shown the spacious wardrobe with vanity desk, minibar with lots of ice, moved on to the long bathroom with double basins, separate toilet, walk-in shower next to the deep tub - from where you could see the Humayun's Tomb - over the private pool of course. Back to the facts: The toiletries were Aman style (means refillable in glasses, however they smelled quite nice and I found them excellent with the location). Without further doubts, the beds were outrageous, the housekeeping excellent, the private pool perfectly cleaned and maintained (no dirt from birds as mentioned in one tripadvisor review), lots of bottled water (free of charge), no noise from neighbors as they are far away and I really loved the attention to the detail with flowers on the table and flower blossoms below the windows to create an unforgettable smell. Plenty of towels were provided and whenever we called the staff for something it was here within 3 minutes which is kind of amazing. While we thought that our room remains the highlight, we were also impressed by the common grounds: a 50-metre outdoor pool with finest tiles and perfect temperature, lots of sunbeds in shade and without, a tennis court with two grounds, two squash rooms, an out-of-this-world gymnasium with every facility you expect of a real fitness studio, one of the most luxurious hairdressing room we have ever seen as well as a vast spa for men and one for women with hot and cold pool, sauna, steam bath and relaxation rooms. The only thing that was missing, were some cooled bottles of water. Having a private plunge pool has many advantages and there are even more things to do when we tell you that the pools are not visible from neighboring rooms. We laid by the pool, unpacked our Bose Wireless SoundLink (it's been our own, the hotel has a docking station but only for iPhone 4 and older - no Lightning plug), had a bottle of champagne and enjoyed the hustling and bustling sound of this 19-million metropolis - I guess it was 1.30 am until we went to bed as it was just too cool to be true! After one of the most heavenly sleeps, we were ready for breakfast. They serve an a la carte breakfast in order to keep things fresh and only prepare the dishes upon request. We had a good cappuccino, a bottle of San Pellegrino, along with puff pastries, muffins, toasted wheat bread, nice jams and butter. 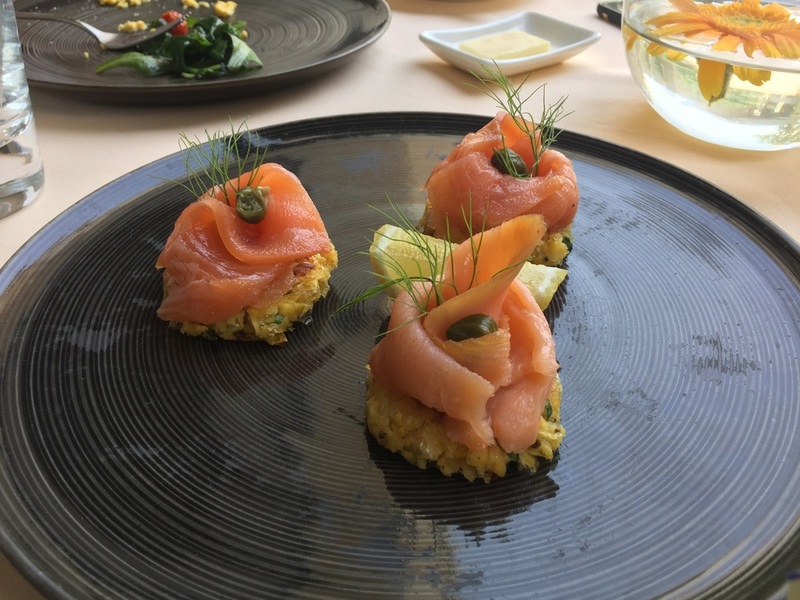 In addition to this continental breakfast we had cornflakes, nicely presented salmon as well as scrambled eggs with prosciutto. Service was attentive and we enjoyed the breakfast, tough the restaurant leaks atmosphere and the air conditioning was blowing a bit too much. What's left to say? 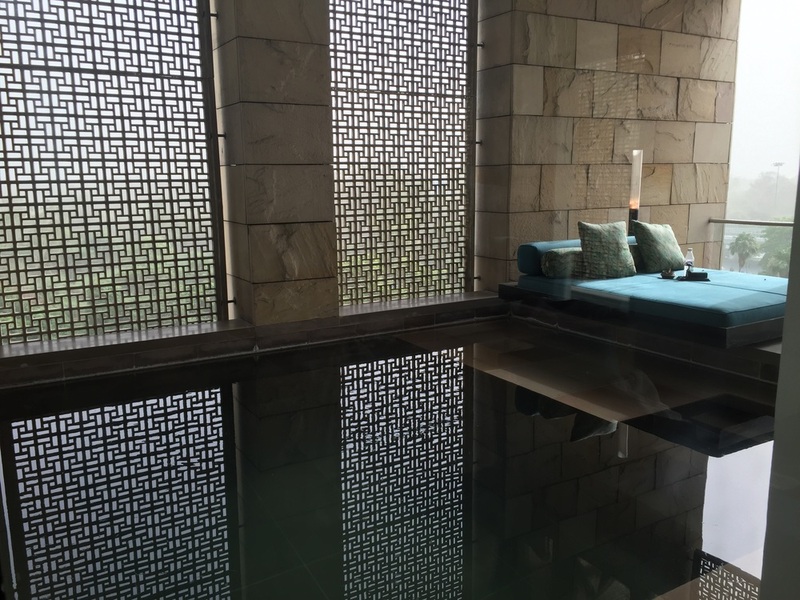 Being named Aman until a few years, The Lodhi still works very closely with Aman resorts in India, so you can expect your stay to be extraordinary, beyond all other stays you had in a city hotel. 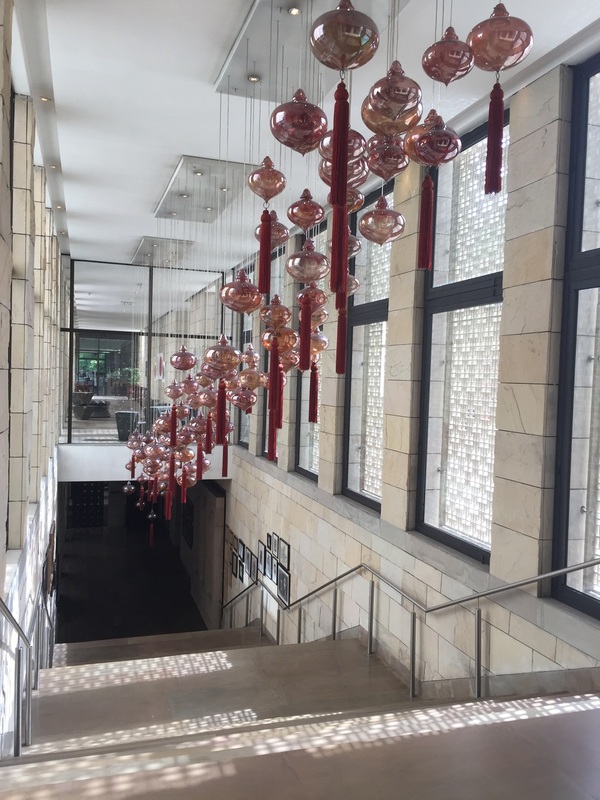 The Lodhi New Delhi has got Corinthia London calibers and therefore is our new favorite city hotel in India! We were guests of The Lodhi New Delhi Hotel, however all above written expresses our own opinion.